Hello, readers! Today I am going to clear all your doubts on receiving payments from Google AdSense account to your Bank account. 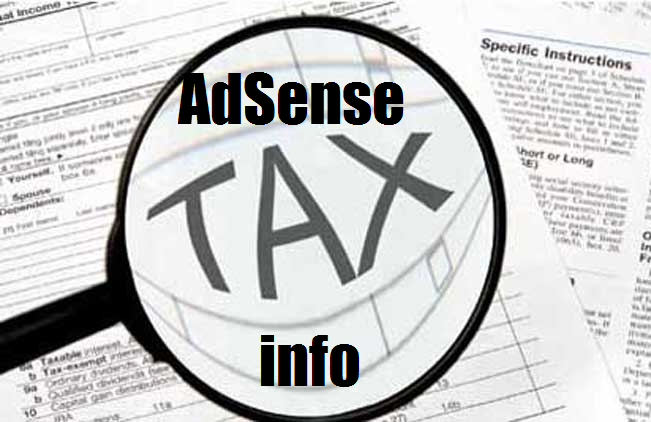 Google AdSense is one of the most widespread monetization techniques used by all the bloggers. It is a plug-and-play advertising network which is truly essential to have a pretty much knowledge on this topic so that you could get complete benefit of the opportunity it proffer generating a lump sum earnings via your blog. Many of the bloggers have some uncertainties regarding the payment transfer to your bank account. So, I thought of explaining you the process of receiving the Google Adsense payment to your Bank account. It is a common question that impels every newbie blogger’s mind of getting payments from Google AdSense. If you’re looking for the process of receiving payment from the Google Adsense then, you’ve landed in the right place. 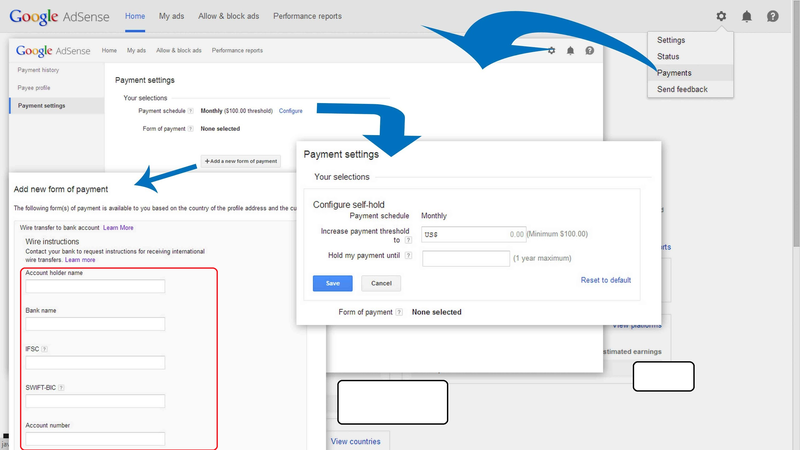 In order to receive Google AdSense payment directly to your bank account, you need to get through the FOUR steps. Check out the detailed steps mentioned below and get your doubts clarified. Take a Look! If you don’t have AdSense account yet and looking to apply one for you. 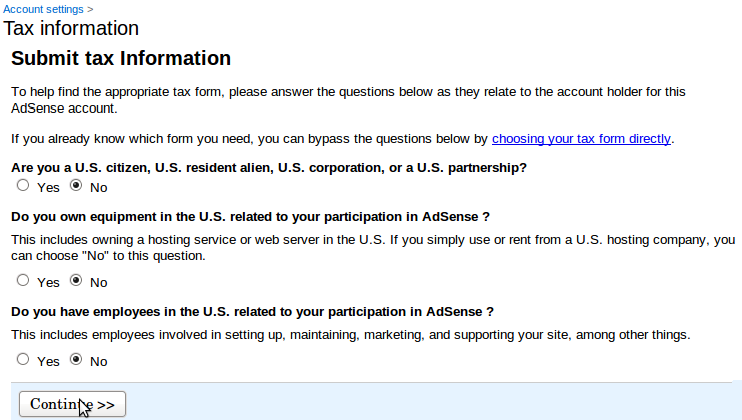 Then here is a clear step-by-step guide to applying for Google AdSense. Tax information is not required for all the locations. Depending on your location, the Tax information page will be enabled for you to submit information accordingly. If the page is not popped up in your account then you need no file any tax information. If in case, the Tax information is enabled in your account just check out the process given below to submit the form. Go to Settings and select Payments. Select payee profile which can be seen on the left sidebar of your account. Just click on Update Tax information. That’s all! You are done with Tax information. This is a very crucial step where you have to be very cautious before entering your information. Payee Name: Enter the payee name exactly which is same as on your Bank account. Don’t guess something and enter the wrong one. Better to keep your bank passbook near you and fill all the information. Address: Give the correct address and make sure that you’re entering your current address so that you can receive the PIN from Google AdSense team. If you have received any letters or couriers to your current address, check that and enter. To update your Payee name and Address information follow the steps below. Click on Gear icon on the right side top of the screen. From the drop down menu, select payment. Select payee profile which is present on the left side of the screen. Then click on the Edit option. Here, you can update your payment address and simply click on save. In case, you missed knowing about Page level ads. PIN: PIN is nothing but Personal Identification Number. To receive payments to your bank account, you need to verify your Google AdSense account. You will receive PIN to your address mentioned in your Payee profile. To receive payments to a bank account, your account should be verified with the PIN which is received to the address you have given your payee profile. 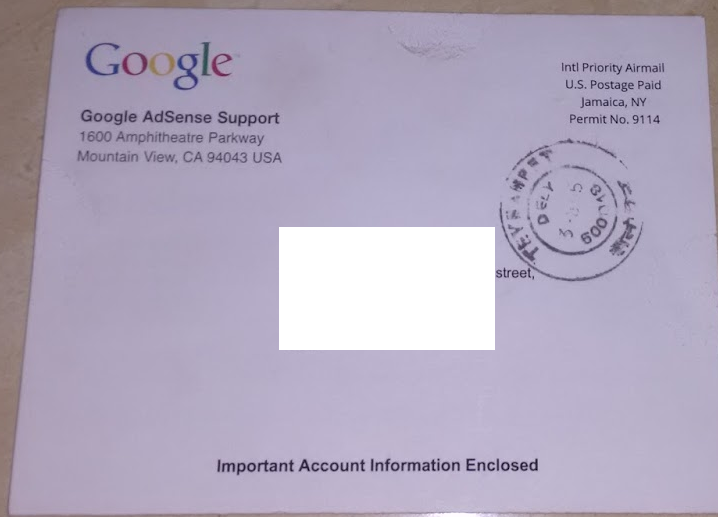 To receive PIN, your Google AdSense account should generate minimum $10. Once it reaches $10, it is automatically enabled for PIN request. It takes minimum 3-4 weeks to receive the PIN. 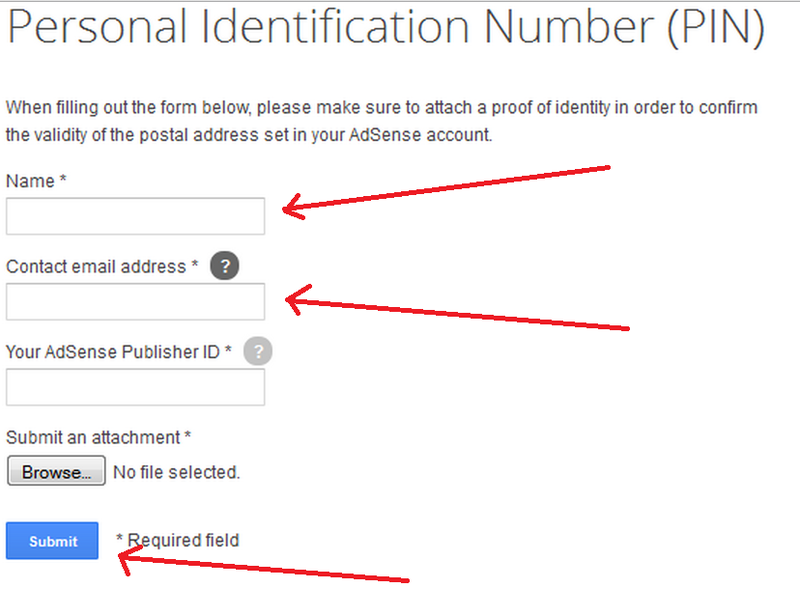 Once you receive the PIN to your address which is given in Payee profile, enter the PIN in your AdSense account. 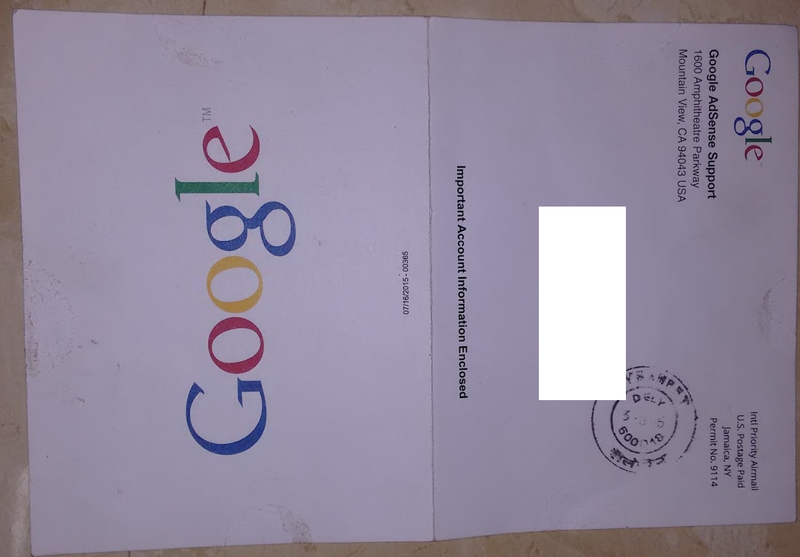 The PIN is received as a card labelled as Google. For reference see the image below. What If you don’t receive the PIN to your address? If you don’t receive the PIN to your address, then you need not worry. Because we have 2 more possibilities to generate the PIN. Totally, we are allowed to request PIN for 3 times. If you don’t receive the PIN for the first time, then go to the payments section again and click on request PIN. You are allowed to request the PIN only after 2-3 weeks. Once you request the PIN for the 2nd time, only after 2-3 weeks of time you can request for the 3rd PIN. So, on the whole, you can do this for 3 times. What If you don’t receive the PIN after 3 requests? If you don’t receive PIN even after 3 request attempts, you are enabled to fill a form to submit your ID ( Identity proof) to verify your AdSense account. When you submit your Identity proof (Adhaar card, PAN card, Driving license, etc), AdSense account gets verified within minutes. Note: If you receive PIN for the first attempt, then your AdSense verification will be done with in a month. 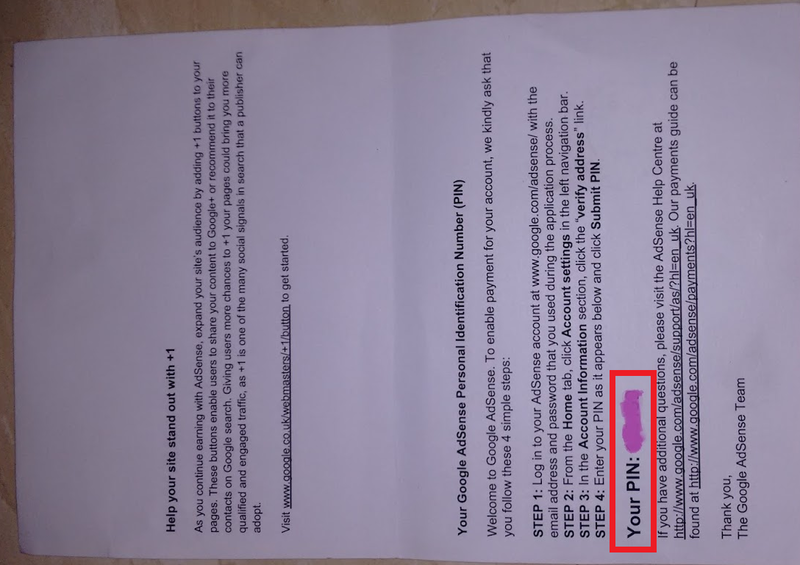 If you don’t receive PIN in 3 attempts, then it takes minimum 3 months to get verified. So, be careful while you update your Address information. That’s all you are done with the second step and verify all the details you have entered in your profile. 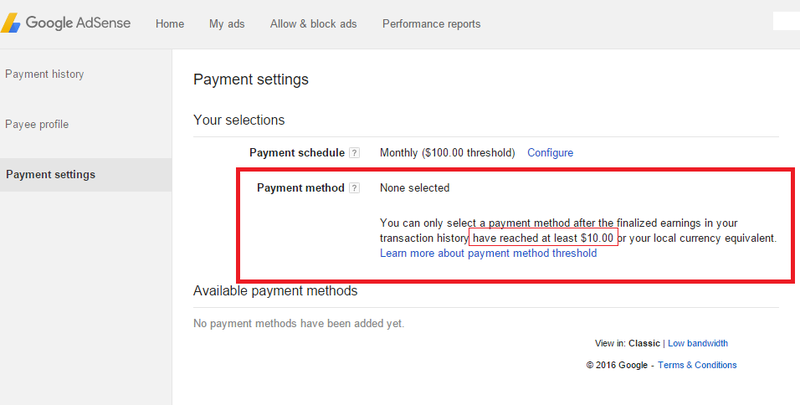 Note: Untill and unless your AdSense account is reached to minimum $10, you are unable to select the mode of the payment. Click on the gear icon located on the right top side of the screen. Then, you must select Payment Settings. Select Add new Payment method or choose the payment method based on your preference. Enter all the details precisely and then click save. Note: It is suggestible to give the bank account details of the name which you have given in payee profile. That’s it you are done. Check the details twice in a thorough manner before heading to the next step. The final step is to meet your payment threshold. To receive payments to your bank account, the minimum threshold payment is $100. Until and unless you meet the threshold payment in your account, you are not supposed to receive the payments to your account. EFT (Electronic Fund Transfer: It takes up to 5 business days to receive the payments. Wire transfer: It takes up to 15 Business days. Checks: It takes up to 3 months to receive your payment. Western Union: It takes up to 15 business days to receive the quick cash. Rapida: It takes up to 15 business days to get the payment. This is the minimum and maximum time to receive AdSense payments to bank accounts. If you want to change your payment method or want to change your bank details from one account to another, then you must do it before 20th of that month. Because, payments will be initialised from 21 itself. 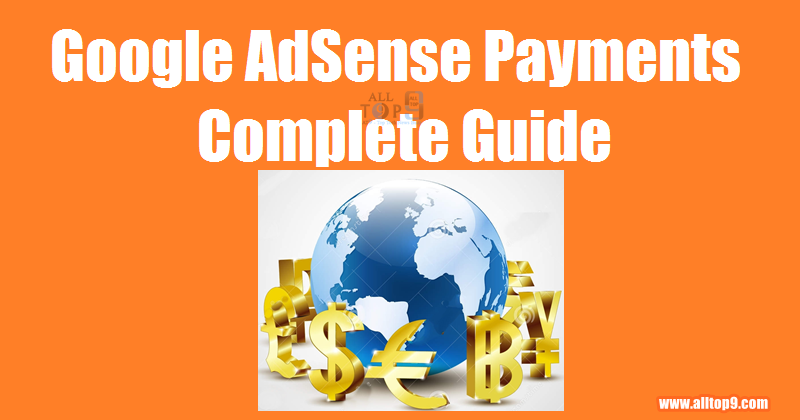 This is all about the Payments terms and conditions to be followed to receive Google AdSense payments to bank account quickly. Hope this article clears all your doubts regarding the payments of Google Adsense to your bank account. If you still face any problems or if you have any doubts regarding payments, feel free to ask me questions in the below comments section. What is the best method of payment.. and what way you’ll follow? To my experience, Wire Transfer is the best way to get payments from Google AdSense team. I get payments through Wire transfer. Thanks Lasya for your great article. I do have a question, normally how much can we earn per month approximately? Request you to give answer in specific and not in generic terms. Bank Transfer Is Wire Transfer !!! So Google adsense deposited a test into my account of .55 on Oct. 5th 2017. I entered that amount for verification twice, but said it was the wrong answer both times. I guess I only have one try left? Is there anyway you can help sort this out? Enter the exact amount that is deposited into your account. For example, your account is deposited with Rs. 2.09, enter 2.09.